An historic part of Leeds has received a boost with the completion of a new £1.2 million affordable housing project. The Rocheford Court development in Hunslet includes nine houses – a mix of two and three-bedroomed properties – and two disabled-access bungalows. All 11 homes have now been leased to tenants. The scheme was delivered by Leeds-based housing association Unity Homes and Enterprise in partnership with the Homes and Communities Agency and Leeds City Council. 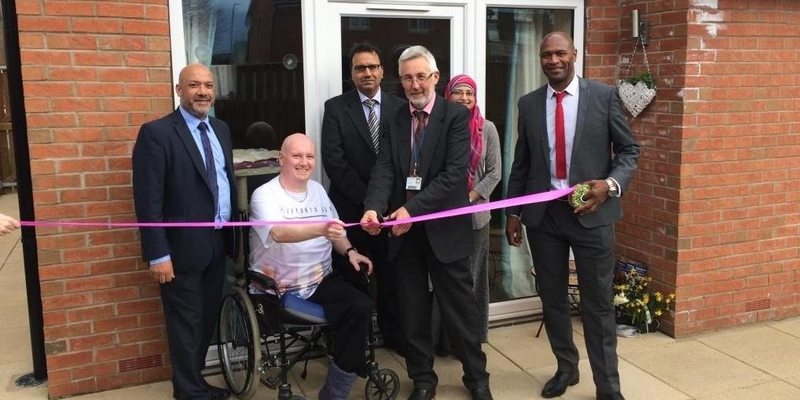 It was officially opened by the council’s executive member for regeneration, transport and planning, Coun Richard Lewis, accompanied by Unity’s chief executive Ali Akbor, regeneration director Wayne Noteman, board members Naseer Ahmed and Shazia Khan, and new tenant Jonathan Griffiths. Mr Griffiths kindly provided the group with a tour of the bungalow he has moved into with his wife Louise and daughter Chloe. He is adapting well to changed life circumstances after a blood clot resulted in the amputation of his right leg less than a year ago. And Mr Griffiths had nothing but praise for his new home and the role Unity Homes and Enterprise played in ensuring it was suitable for his requirements. He said: “Unity has been fantastic. The layout of the property was excellent to begin with, making it easy for me to get around. However, Unity ensured that it incorporated a lowered kitchen sink, work top and hobs. The bathroom has also been kitted out with a range of facilities which are equally accessible for me and able-bodied users. Ali Akbor, chief executive of Unity Homes and Enterprise, said: “I am thrilled at the completion of such a high quality development and, in particular, by the bungalows. “Unity is absolutely committed to serving the needs of our tenants, old and new. We want to make their lives better. We worked closely with Jonathan, social care professionals and other partners to equip the property to his specific circumstances. We also arranged follow-up visits from Unity staff after Jonathan and his family had moved in. Coun Richard Lewis, executive member for regeneration, transport and planning at Leeds City Council, said: “We are delighted to be working in partnership with Unity Homes and Enterprise to deliver this range of new affordable housing in Hunslet. “The completed properties have been built to the highest standards and it is very impressive that they have already all been taken by new tenants.